An intricate raised gallery in luxurious 14K white gold is supported by four bold crusader prongs provide the bold look needed to match the love it expresses. 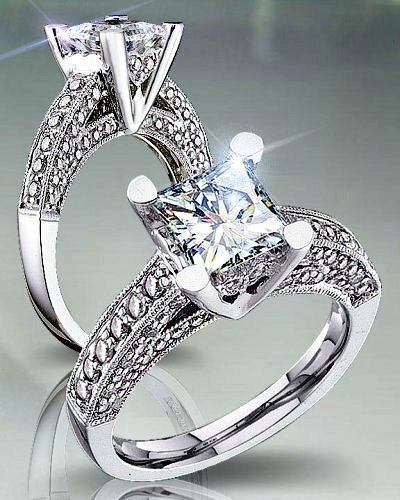 This one-of-a-kind diamond engagement ring will get plenty of stares and complements. Its unique design will impress everyone that sees it. At the center of this work of art is a sparkling princess cut diamond that has a weight of 1.0 carat. This beautiful diamond has a clarity of SI2 with a color grade of G. At the base of the setting, resides round cut diamonds that encircle it. The side diamonds have a total weight of .70 carats. The clarity is graded SI1 with a color grade of G. This exquisite setting is made in 14K white gold.